I went to the Jacksonville Beach Art Walk again this week on Tuesday night. It was very successful for me. I sold five paintings! Two large and three small ones. I sold my "FLORIDA PANTHER" and "RACING FOR HOME", two 5 x 7 seascapes and a 4x5 seascape! I had grown very fond of the panther because it took so long to paint him, so I was a little sad, but I got over it. The gentleman who purchased him really wanted him and came by my booth 3 or 4 times to look before he finally took him home as a gift for his wife. It's funny, but the other sailboat painting was a gift from a lady to her husband! I have pictures of these two in AVAILABLE PAINTINGS. Now they say sold of course! WEDNESDAY 15th: Wow! When it rains, it pours! I have just been given ANOTHER opportunity to show my art! This time it is a large commission for a local restaurant here in St. Augustine. 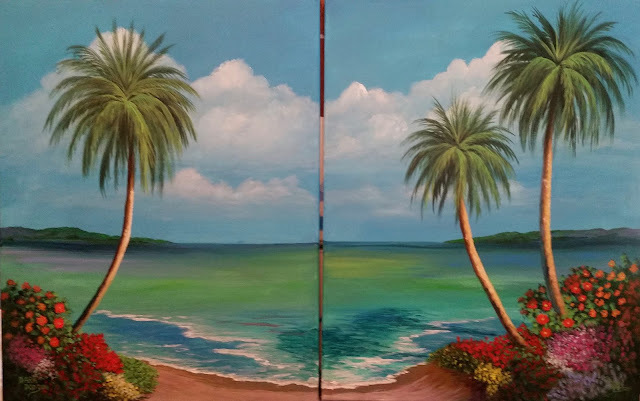 They are opening a place out at the beach and wish me to fill it with tropical art! The owner said they have approximately 35 feet of wall space for me to use. I went out and took a look and then got to work. It has to be ready to hang the last week of February. It looks like there is room for 3 LARGE pieces plus maybe a couple small ones. I will know more when I can actually measure the space. In the meantime I have already finished one of the pieces. It is of course tropical and very serene. I LOVE turquoise and it fits this theme perfectly! It is actually a two canvas set making up one painting, called a DIPTYCH. (dip-tick) When there are three canvas it is called a TRIPTYCH. (Just a little art vocabulary here) It measures 28 x 44 overall so a nice size. These are very popular and I painted it so each could stand on it's own. Then, I actually had a friend give me a very large canvas (48 x 60) and I will use it here if it looks like it will fit. But before I start it I want to measure that wall! I certainly don't want to be wasting my time on something that won't work considering I have such a short time frame, especially something THAT big! One thing though, this means I won't be working on the Highlands painting for the Wildlife show for a few weeks, but that's ok. I'm happy to put it aside for now. (That's the advantage of starting a painting ahead of time) I also have another smaller commissioned piece that I will have to put off for a few weeks, but I am sure she will understand. But I digress. As I said, I finished the Diptych so I have a picture of it below. The others will not look exactly like it of course, but they will all fit together as a common theme and coloring or at least compliment one another! One thing all of this tells me is that you may start out slow... but BE PATIENT! I have been painting steadily now for almost three years after many years of doing other things, and my work is just now starting to take off. But if you hang in there and keep improving your skills, you will get somewhere! BTW, I have a picture of my art at the AVONLEA MALL/Design Center in Jacksonville, FL. It is not a good photo. I haven't been able to get up there so all I have is the one my friend took for me. It is from a poor angle. I hope to get up there soon to take my own photo. In the meantime, enjoy the photos and once again, Thanks for looking! One nice thing about being in AVONLEA is that they also sell online. They use eBay and their own website to advertise the items located in their store. So my art will be featured in both places. They are a premier N. FL store, so they actually sell and ship nationally and internationally. PLUS, they handle the sales and shipping for you. What more can I ask? They do charge a commission, but it is very low! Be sure to go over to my AVAILABLE PAINTINGS page and check out my two sold paintings!